There is superficial search and there is deep search. While Google is great at the first, it’s not so good at the second. There are some enterprise search applications which can claim the centre-ground between the deep and the superficial, but most of the runners in that particular race fall somewhere along the way and barely even glimpse the finishing line. Not that it matters any more, apparently, because if search analyst Stephen Arnold is right, search is dead. Arnold is right that the domain of knowledge discovery is ripe for an orthogonal change – a disruptive intervention as complexity theorists would call it. 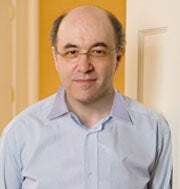 Enter US-based British mathematician Stephen Wolfram. Wolfram is no stranger to orthogonal change, having published in 2002, a monster of a book entitled A New Kind of Science (NKS). NKS essentially proposed that accepted scientific method be augmented by an inverted approach, whereby hypothesis is not solely tested by experimentation, but where experimentation may also generate hypothesis. At 1280 pages, it took me months to read, despite its author writing very lucidly about complex mathematical concepts (maths was never my strong point). In NKS, Wolfram presents (in narrative and over 1000 illustrations) the results of years of computational experimentation with ‘simple programs’. Simple programs are typified by cellular automata – grids of cells, each of which can exist in some defined ‘state’ with finite values (+ or -, on or off, 1-2-3-4-5 etc.) in any number of dimensions, accompanied by certain rules regarding how adjacent cells may interact in time. Wolfram devised hundreds of such cellular automata and associated interaction rules, then explored, through his Mathematica computation engine, how each of them developed – or not – over time. He discovered that a significant proportion of them can produce surprisingly complex and sustainable patterns of results (illustrated in the book, as right), some resembling patterns discovered decades earlier by complexity pioneers such as Lorenz and Mandelbrot. Wolfram was much criticized at the time NKS was published for not employing ‘proper’ scientific method in his research. That’s a bit like criticizing Einstein for straying outside the boundaries of Newtonian physics, it seems to me. He was also criticized for not having any immediate applications for his discoveries. Well, seven years on, Wolfram appears to be striking back at his critics with the imminent launch of Wolfram Alpha, a ‘computational knowledge engine’ combining Mathematica with principles he first described in NKS. “Wolfram Alpha has trillions of pieces of curated data,” Wolfram said. “We’re getting data from both free data and licensed data – some of it is very static. A lot is data from feeds that come into our system, and we’re running through this partially automated, partially human process, correlating data and verifying data. It’s set up so it’s organized and clean and computable. When it was first unveiled in March, Wolfram Alpha, a new type of search engine created by computer scientist Stephen Wolfram, got a lot of buzz. Naturally, some people threw out the “Google killer” title; but it seems to be a different beast, as it’s all about knowledge search. That is to say, you ask a question, and you get an answer; with Google, you ask a question and you get a link to a bunch of documents. That may sound a bit bland, and simplistic, but the select few who have seen it, seem to think it works really well and could be a game changer. There is considerable cynicism surrounding the WA announcement, and perhaps Google deserves to enjoy a brief whiff of schadenfreud before WA launches publicly in May. We’ve also yet to hear what the Semantic Web community thinks about WA and how it relates (if at all) to what they are trying to achieve. Until we know more about how Wolfram Alpha works and what kind of results it can produce over what domains of discourse, it’s difficult to form an opinion. You can find out whether all the fuss is warranted by keeping an eye on the Wolfram Alpha Blog and monitoring the responses in the specialist media. You are currently browsing the archives for the knowledge synthesis category.